Have you ever had one of those moments when all seems right in the world? More than that, when life seems to be a series of steppingstones that has led you to one specific place and time? I felt like that our last night in Olomouc, Czech Republic. We’d just had some great pizza and ice cream, and our mission team was walking back to the Bible college where we were staying. Laughter echoed off the centuries-old buildings and cobblestone streets. The setting sun cast a warm glow over the ancient city and peace settled in my heart. Earlier that day we’d gotten back from youth camp. Thirty Czech teenagers had given up five days of their summer vacation to hang out with Americans and improve their English. Many, many of them also heard about a relationship with Jesus for the very first time. 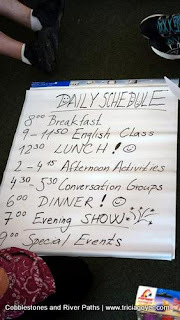 Every night at English camp we shared our testimonies. One by one, eight of us got up and shared our pasts, our pain, and our decisions to follow Jesus Christ. Both of these young women spoke to me through translators. They didn’t speak English well enough to share their hearts in a second language, but even without the translator I saw a difference on their faces. A new hope sparkled in their eyes. And these young women—along with more than a dozen others—lined up to get a Bible of their own when offered one. Amazing. Exciting! God’s Word given to eager hearts. It’s crazy when I think about the series of events that led to this. 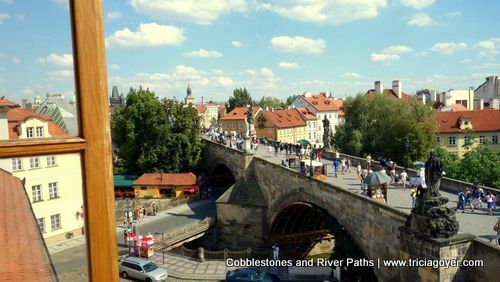 The first steppingstone was my trip to the Czech Republic in 2000 with my author friends Cindy Martinusen Coloma and Anne de Graaf. 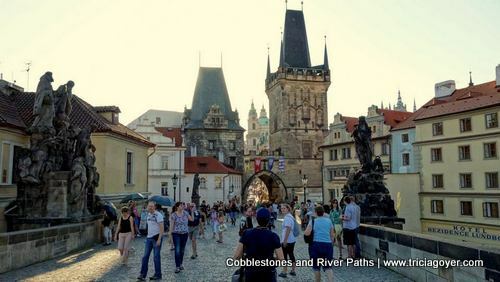 I can’t explain why I fell in love with Prague and the Czech Republic, but I did—so much so that I traveled there again in 2002 to research for my novel Night Song. I chose the location so I could go back to Prague. A good writer always does through research, you know. Listening to God’s voice then led the Goyers to go on two family mission trips in 2008 and 2009. My daughter, Leslie, fell in love with the country, too, and she’s visited every year since 2008. This summer she spent two months there, falling even more in love with the country, falling even more in love with the people. Vacation, research trips, mission trips, (a Czech exchange student, too), and extended visits. A special peace comes when you return to a place and realize it’s exactly where you’re supposed to be. And that’s how I felt the last night as we walked back to the Bible college: like I was standing on a stone in a river. I could clearly see the path behind me, leading me—us—to this place. I could also sense that the stones continued . . . to places I couldn’t yet see. But one step by one step, we were following God’s purpose for us to be spots of light—sharing the truth of Jesus with the Czech people. I’m unsure where those steps will lead, or who God will ask to join in the journey. Our daughter Leslie is praying about making the Czech Republic her forever home. If that is God’s plan—or something else—it’s good to know that our family has followed God’s leading, and we’ve tasted the joy of having our hearts connected to a beautiful country with beautiful people on the other side of the world. As for Lucie, Jana, and the others . . . their stories are still in the works. I’m not sure what God is going to do with their lives, but I know He has a plan. He always has a plan. Sometimes it just takes a while to realize how those seemingly random steps lead to something greater. Something beyond yourself. Something similar to laughter bouncing on cobblestone under a golden Czech sunset. I would love to go back to Czech Republic! Our visit to Prague a few years ago was so wonderful. So much inspiration for story ideas and a feeling for a different kind of culture and human existence. No wonder so many great writers came out of Europe! Thanks for sharing!